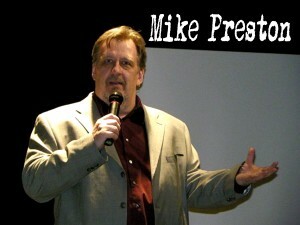 Mike Preston has been listening to people all his life. And he’s heard enough. After a dozen years of working with the homeless and mentally ill, Preston made the natural transition into standup comedy, bringing his experience to the stage in a humorous presentation. With his slightly damaged take on things, Mike Preston has worked comedy clubs and sordid one nighters from coast to coast, and made several TV appearances, including SHOWTIME’S COMEDY CLUB, and NBC’S FRIDAY NIGHT. For his first two novels, THE MORON CHRONICLES and RETURN OF THE MORON, Preston drew on his years in Social Work to produce a “politically incorrect, yet essentially accurate” portrayal of alcoholism, mental illness, and life on the street. self-help books flooding the market and makes the perfect anonymous gift. Preston’s most recent publication is SWAY, a darkly comedic ghost story. While he continues to write and perform, Mike Preston has added the title of “Talk Show Host” to his ever expanding resume. PSYCHO BABBLE, Preston has discovered yet another outlet for his unique brand of humor.